There were many interesting moments over the course of the final season in the Metrodome, and many fans turned out to see them. In the first 81 regular season games, the total attendance ranked third all-time for the Minnesota Twins; second only to 1988 and 1992, the two years following the team’s World Series titles. It would take 82 home games before the team’s fate could be decided however, and in the final Metrodome game, a regular season record, 54,088 fans showed up to take the 2009 regular season attendance total to 2,416,237 for the season. In 2008, the team averaged a total of 28,405 fans per game. 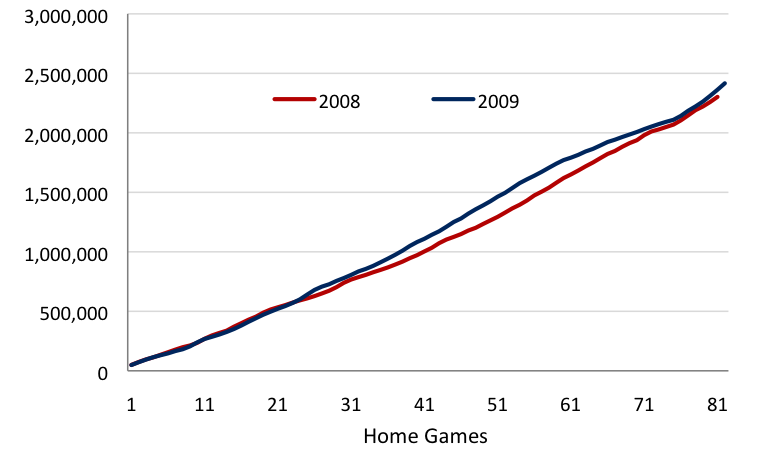 This season, in the final season indoors, the Twins averaged 29,466 fans per game, an increase of 1,405 fans per game. Overall, the team brought in 113,806 more fans in 2009 than last season to give them the third highest attendance in team history. The average attendance around Major League Baseball in 2009 was right around 2,400,000; with an extra game the team was able to surpass that. With an expected capacity of 39,800 at Target Field next season, the most fans the team could draw in 2010 is 3,223,000. After making the playoffs, and with 2010 being the Inaugural Season at Target Field and the 50th Season in Minnesota for the organization, next season could see historic attendance totals. One Day. One Game. One Season. For the second time in as many seasons, the Twins’ playoff hopes will come down to one game. One game will decide if the Minnesota Twins end their season as one of twenty-two non-playoff teams or continue it as the American League Central champions. The record can be thrown out, it is now insignificant. The one game that the Twins currently stare in the face will determine the season’s path, and the implications are clear: win and go to New York, lose and go home. One year ago, almost to the very date, the Twins threw the records out and took the field in Chicago to decide their fate. One run in one game ended the season, and a moment of opportunity became a moment of heartbreak. If there is one team that knows what it is like to have a tiebreaker determine the purpose of the previous six months, it’s the Twins. When they take the field against Detroit, they’ll do so in historic fashion – as the first team to ever play in a one-game playoff in back-to-back seasons. What seemed impossible on Thursday night, became reality on Sunday. Trailing by two games with three remaining entering the weekend, the Twins faced an uphill battle to win or tie for the division. The likelihood of such things happening were small, but as the team took the field Sunday, they did so tied atop the American League Central. A Twins win coupled with a Detroit loss would have guaranteed the playoffs for Minnesota and been the perfect ending to a perfect weekend. After the Tigers avoided a late comeback attempt by Chicago however, the Twins’ victory meant only a guaranteed tiebreaker game to be played at the Metrodome, and a first in baseball history – until this past weekend, no team had ever blown a three-game lead in four days. Four weeks ago when the Twins trailed Detroit by seven games, things looked bleak, and the chances looked even more bleak when Morneau’s season ended three weeks ago. Behind heart-filled performances from the likes of Joe Mauer, Michael Cuddyer, Delmon Young and others, the Twins now have a chance of a lifetime. One game, on one day, will decide the fate of the entire season. The Twins have been in the situation before and know the disappointment. They now have a chance, in front of more than 50,000 fans, to change last season’s outcome, make one more memory and win one more division under the roof. Never before in the history of Major League Baseball has it happened. No team has ever made the playoffs down two games in the playoff race with just three games remaining. The Twins face that exact scenario as they begin their final regular season series at the Metrodome this weekend, but don’t tell the team it isn’t possible. Before team leader Joe Mauer won his first batting title a few years ago, no American League catcher had ever accomplished such a thing. It wasn’t possible by history’s standards, but it happened, and now Mauer is three games away from a third silver bat. It’s highly unlikely maybe that the Twins can make the improbable comeback and face New York next Wednesday in the first game of the ALDS, but for at least another day the Minnesota Twins’ season continues as more than just a countdown to the end. When the Twins take the field against the Kansas City Royals for the last first-game of a home series under the roof, they’ll do so as contenders in the one remaining undecided division in baseball. Sure many things may need to fall into place for the improbable comeback to occur, but the chance is there. The first thing the Twins must do to maintain their chance is win; they must win at least two games to have any hope, and there’s a good chance they’ll need to complete one final sweep at the Metrodome. The other thing? Cheer for Chicago. To win the division with no one-game playoff, the Twins would need to sweep Kansas City and the White Sox would need to sweep Detroit at Comerica. To tie for the division and force a one-game playoff, the Twins would need to sweep Kansas City and the White Sox would need to win two out of three against Detroit. To tie for the division and force a one-game playoff, the Twins would need to win two out of three against Kansas City and the White Sox would need to sweep Detroit. Any of the three possibilities are farfetched, but some magic in front of expected crowds of well over 40,000 fans Friday and well over 50,000 fans on Saturday and Sunday could provide a boost. The Twins have played all season for a chance, and with three days they now have one. The team controls only part of their fate, but maybe, just maybe, there will be one more Metrodome memory worth holding on to.